Ultrasound Technician News – USA specific Details: Salary, Jobs, Schools and more..
An ultrasound technician, also called a diagnostic medical sonographer or just a sonographer, uses what is called an ultrasound scanner to examine the inner organs of the body, as well as tissues and blood flow. Ultrasound scanners are comprised of a computer console with peripheral electronics and a video display and what is called a transducer, the handheld device that is applied to the body and sends out the sound waves. The resulting images immediately show up on the video display in real time. 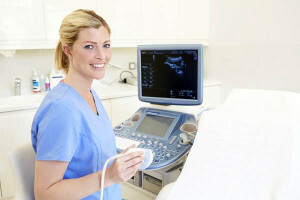 There are several specialties for ultrasound technician careers. While ultrasound is most commonly associated with pregnancy, wherein the obstetric and gynecologic sonographer takes a real-time image of the fetus to assess its development and health, there are several other fields from which you can choose. An abdominal sonographer looks inside the abdominal area to view the kidneys, liver, gall bladder, bile ducts, pancreas and spleen. An ultrasound technician who specializes in breast Sonography works in tandem with the mammography department to detect breast cancer and track the progression of breast cancer tumors. You might also specialize in musculoskeletal Sonography, which is 1 of the fastest-growing areas of expertise in the field, focusing on muscles, ligaments, tendons and joints. This is useful for sports injuries and pinpointing abnormalities, as well as guiding therapies. Neurosonographers specialize in the nervous system and brain. Their work diagnoses strokes, brain tumors, fluid build-up and vascular problems. There are also a number of modes of sonography, all of which you should learn in ultrasound technician school. The most commonly used is A Mode, where a single line is scanned through the body. B Mode uses more lines, creating a 2D image. C Mode combines these, using A Mode for gathering data and B Mode for scanning the findings. M Mode is used in tandem with either A or B and creates video of the image. The Doppler Mode, which has a variety of types including Trans cranial, Color and Continuous, allows for the view of blood flow. Pulse Inversion is used for viewing internal gasses. There are several ultrasound technician jobs that you can choose from. The most recognizable is the obstetric and gynecological sonographer, who performs ultrasounds during pregnancy to assess the health and development of the fetus. They also use Sonography to diagnose a number of gynecologic issues. Abdominal sonographers look inside the abdominal cavity and pelvis to assess organs like the kidneys, liver, gall bladder, pancreas and spleen. By using the Doppler Mode, they can also view blood flow. The imaging helps diagnose conditions like appendicitis, liver enlargement, kidney stones, gallstones and tumors. Breast sonographers work in complement with mammography’s and are able to use Sonography to detect cancers that mammography can miss. Neurosonographers assess the central nervous system and brain so that physicians can diagnose strokes, brain tumors, fluid build-up and vascular problems. Musculoskeletal sonographers, who are seeing high job growth, image muscles, ligaments, tendons and joints. Their work is used in sports medicine and can detect abnormalities with great precision. They can also guide therapies, such as needles for drainage, with accuracy. The duties of your ultrasound tech job will vary depending on your field, but you should expect to take patient histories, explain the procedure and answer questions. This can be difficult as your patients might be nervous, frightened or very ill or injured. You will prepare the patient by positioning them and applying the gel that allows the sound waves to operate. You will then perform the initial analysis of the image, checking to see that the physician will have every view needed to make a diagnosis and that each image is clear. Your training will teach you to identify abnormalities and you will be expected to present the doctor with an initial assessment. Finally, you will record the findings and maintain patient records. Ultrasound technology jobs are some of the fastest growing in medicine. Sonography allows for a level of diagnosis and treatment previously unavailable and is mostly noninvasive, which improves both treatment and patient comfort. Good ultrasound techs are particularly needed to treat the expanding aging population, who experience more injuries, blood clots and tumors. The expectation is that the need for sonographers will grow 44% by 2020. The median ultrasound tech salary is $68,900. A starting wage, depending on region, workplace and your experience, can be as low as $44,000, but if you do good work and gain further specialties, you can soon command a higher wage. Top salaries in the field are over $88,500. The most common degree level ultrasound techs earn is a 2-year associate’s degree. You can also earn a 4-year bachelor’s degree, which will position you to work in a higher-level role as a professional ultrasound tech. There are also 1-year certificates available, but employers will only consider this qualification if you have cross-trained and have already been working in medicine. If you have a degree in radiologic technology or nursing, you might be hired to learn Sonography on the job. You may also have to earn professional certification in your chosen specialty. Some states will also require a license. You will have to do research to determine what your region expects so that you are prepared for your job search. Once you are practicing, you will also need to take regular continuing education to maintain certification. Accredited programs will offer different courses, but you can expect to study monographic images, the abdomen and small organs, obstetric and gynecological ultrasound, vascular ultrasound and ultrasound physics and instrumentation. One of your most important classes will be patient care, which will prepare you for a lot of situations that you will encounter in medicine. You will also do clinical training and can expect to do at least 1 rotation in each field of Sonography. Most programs will arrange your clinical schedule for you, although if you wish to find your own internship, that option might be available. Some schools offer didactic education online, but learning to become an ultrasound technician from home should only be pursued if your schedule allows for no other option. Ultrasound techs who have taken coursework online are becoming more accepted by employers, but unless you are cross-training, you will likely find it more beneficial to take campus-based classes. The fast-growing field of Sonography means that good ultrasound technicians who have trained in accredited programs are in demand. You should attend a school that offers clinical rotations in several fields so that you can choose the specialty you enjoy the most. Ultrasound technician college courses teach you the mastery of Sonography so that you can become a vital member of a medical team, using sophisticated imaging equipment to view inside the human body, taking real-time images of tissue, organs and blood flow. You will take classes in the various aspects of Sonography, including obstetric, abdominal, small parts and musculoskeletal. You will also put all these into practice during a number of clinical rotations. Other important classes will include patient care, physics and anatomy, all of which will teach you to be a top ultrasound technician. The most common educational qualification for an ultrasound technology career is a 2-year associates degree earned at one of the many accredited ultrasound technician college programs. It is possible to earn a certificate in 1 year, but these are only recommended if you are cross-training into the field from another area of medicine, such as nursing or radiology technology. A few colleges offer bachelor degrees in ultrasound technology, and to date there are 2 master’s degree programs accredited by the Commission on Accreditation of Allied Health Education Programs. While obtaining a bachelor’s degree will give you more training and allow you to start work at a higher level and salary, bachelors and masters degrees are really only for those who are interested in pursuing research and teaching in the field. Didactic Sonography is the most obvious of your ultrasound tech college requirements and will teach you each area of ultrasound imaging in complement with clinical work. Obstetric, small parts, abdominal, neural, vascular and musculoskeletal Sonography will be studied and you will learn to discern the difference between normal and abnormal functions. The best ultrasound technician training will offer a number of clinical rotations so that you can experience a wide variety of fields. You should expect to undertake at least 4 different rotations, training in the maintenance and inspection of the equipment as well as its use. Physics is a key element of your ultrasound technician training and it applies to everything you do on the job. You will study the physics of ultrasound equipment and advanced physics and discover how it affects your choices when using the imaging machines and choosing transducers. Even if you already have a medical background, you will find standard anatomy classes very useful as you pursue an ultrasound technician career path. You will study the whole of the body, mastering medical terminology and what constitutes normal and abnormal functions, learning how to apply that knowledge to images in a sonogram. Patient care is one of the most important aspects of training, as the ability to work well with a patient can affect the sonogram and thus the diagnosis and treatment. You will discuss theories of patient care, often engaging in role-playing exercises and work with patients in rotation, learning how to communicate with them and monitor their physical and mental state during the procedure. Excellent communication skills are crucial to a successful career as an ultrasound technician so that you can work effectively with both patients and doctors. Patient care classes and carefully chosen electives will teach you techniques for communicating with a diverse range of people under a variety of circumstances. Sonography demands strong coordination abilities, as you have to move your hand to precise areas of the body while keeping your eyes on the display and sometimes using your other hand to keep the patient steady. During your rotations, you will practice and perform Sonography to test your coordination under the most trying of circumstances. Some ultrasound tech colleges will expect you to demonstrate stamina as part of their prerequisites before you begin study because the need to be physically strong is so critical for an ultrasound technician. You will develop stamina during your clinical rotations, learning how to spend long hours on your feet while maintaining comfort and being able to manipulate machines that weigh over 800 pounds. The ability to be precise is critical for every aspect of Sonography, from taking detailed patient histories to being able to aim the transducer at the exact right spot on the body. You will spend many hours practicing precise Sonography and might even develop techniques for practicing outside of class as well. In Sonography, every little detail counts and might in fact spell the difference between a precise and an incomplete diagnosis. You will learn to read images with care so that you can detect tiny abnormalities or anything that might require further investigation in ultrasound technician schools. Overall, online ultrasound technician degrees are not attracted or encouraged by employers. Being an ultrasound technician demands precision, commitment, attention to detail and an excellent capacity for patient care. While much of this can be taught in your clinical rotations, it will all be supplemented in your academic coursework if you are in a campus-based program. While employers know what to expect if someone has a top traditional ultrasound tech degree, online coursework done exclusively, rather than as an occasional supplement, will not convince them that you are the best candidate for an ultrasound technician job. Many traditional schools have strict requirements for applicants to the program, including a certain level of fitness and the ability to lift at least 50 pounds, which will be demanded by employers as well. Online ultrasound tech degree programs will not necessarily mandate such requirements, and if they are not asked to be met in your clinical rotations, an employer might think you do not meet the fitness standards required to perform basic work tasks. However, there are a few ways to convince an employer to consider you for an ultrasound technician career even if you have earned an online ultrasound technician degree. If your clinical work is outstanding, with supervisors noting your excellence in every aspect of Sonography, this can go a long way to helping you get hired. You can further improve your chances if you have undertaken extra internships. With such supplementation for ultrasound technician degrees, online coursework will look much less weak. Furthermore, your degree must be earned from a properly accredited school. If it has not achieved accreditation by the Commission on Accreditation of Allied Health Education Programs (CAAHEP), you will have a very hard time securing a top job. For higher ultrasound technician degrees, online work might be more acceptable because it is understood that you might be trying to further your career while also holding down a full-time job, making distance learning one of the few viable options. In addition, because there are so few accredited programs that offer a bachelor’s degree at all, you may have no choice but to earn an online ultrasound technician degree at a higher level if you do not want to move to another state to go to school. You should be aware, however, that CAAHEP only accredits 2 schools offering online courses for a bachelor’s degree in ultrasound technology and does not accredit any programs offering an online master’s degree in the field. But there are also continuing advances that make online education more effective and acceptable. In this article from the University of Arkansas for Medical Sciences, the discussion revolves around innovations in hand-carried Sonography equipment that improves distance learning. As the field continues to develop, online ultrasound technician degrees will become more acceptable to employers. However, you will still be expected to have excellent hands-on experience, and you must be ready to prove yourself worth hiring from the outset, regardless of the degree you present when you apply for a job. If you are in an online ultrasound technician training program, the most important thing is to practice as much hands-on work as you possibly can. Your clinical work will be assessed much more closely if your ultrasound tech courses are completed online, so you must be able to really prove yourself on the job. You should only consider ultrasound technician online training programs that are properly accredited. Anything further you can do to improve your skills and knowledge, as well as prove that you are fit and able, will help you secure a great job as an ultrasound technician. 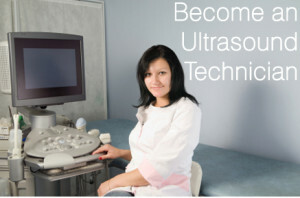 Employers have a hard time accepting a degree earned through an ultrasound technician online training program. An on-campus program is considered the best way to learn the ropes due to the physical nature of the work. Whether you are cross-training into sonography with a certificate, earning an associates degree or furthering your career with a bachelors or a masters degree, the expectations are the same: you must get the hands-on experience demanded to be able to excel in the profession. Employers know that some ultrasound technician online training programs will not assist you in securing clinical rotation placements. You will be judged on your initiative to both get your own top clinical position and then go the extra distance within your rotations. If you do this, you can position yourself as a top applicant for most jobs. For any degree, you should only consider accredited online ultrasound technician programs. Consult the Commission on Accreditation of Allied Health Education Programs (CAAHEP) to find an accredited program that will suit you. Going above and beyond will always help convince employers to hire you. An online ultrasound tech training program will not necessarily demand that you prove physical fitness and stamina required for the job. Therefore, undertaking an extra rotation handling the heaviest equipment or specializing in the least mobile patients will indicate to employers that you are a quality candidate. The initiative you demonstrate in taking on more rotations than your program requires will also impress an employer, who will always be looking for candidates with the most experience and willingness to learn more. For any student, it can be useful to join 1 or more of the professional organizations for those in sonography. For those in ultrasound technology online training programs, it will demonstrate a seriousness and professionalism that employers might otherwise doubt. The Society of Diagnostic Medical Sonography is the standard membership organization. You might also join a society based on your specialty. Such membership will also offer job advice and boards to which you would otherwise not have access, giving you yet another leg up into the field. Enrolling in ultrasound technician programs online can place you at a disadvantage in your job search, but you can go a long way toward overcoming employer concerns about distance learning if you can prove you have excellent clinical experience. If your clinical supervisors rave about your ability, initiative, attention to detail and patient care, you will become a top candidate for jobs. You can improve your job outlook by making connections through membership in the appropriate professional organizations, further displaying your initiative, dedication and professionalism. In addition, if you earn ultrasound technician certification, you may be able to boost your resume even with an online degree. Becoming an ultrasound technician necessitates earning proper certification from an accredited program. You must have the appropriate ultrasound technician degree, which is most commonly an associate’s degree. Certificates, bachelors and masters degrees are also available. When you finish training, you must then take licensing and certification exams, which vary depending on your state and specialty. If you pass these, you can then enter the profession. Employers prefer candidates with a lot of experience, so you should seek out ultrasound technician certification in several areas. Basically, the more experience you can get in training the better, so it is a good plan to take an extra internship if your schedule allows it. There are 1-year certificate programs available to become a sonographer, but these are only considered appropriate for those who are cross-training into the field from another medical area, such as radiology or nursing. Such fields are closely enough related that you can easily apply what you already know to Sonography, mastering the skills quickly. You might even be able to arrange on-the-job training at the healthcare facility where you already work, so that a job will be ready for you once you achieve your ultrasound technician certification. The majority of ultrasound tech schools offer 2-year associates degrees. These rigorous programs teach you didactic courses in Sonography, physics, anatomy and patient care, combined with several clinical rotations in assorted areas of Sonography. When you receive your ultrasound technician degree, you will usually need to take exams for certification. What certifications are necessary will depend on your location and specialty. Your region may not require a license but many employers prefer that you be licensed before you begin practicing. If you are already working in the field and are interested in pursuing further ultrasound technology career advancement, you might earn a bachelor’s degree. This will enable you to go into healthcare management and work for the government in shaping health policy. The highest ultrasound technician degree available is a master’s degree. If you are interested in research, publication and teaching, as well as working in the upper echelons of management and public policy, a master’s degree will help you get there. Many of these positions will allow you to earn a higher ultrasound technician salary. You should be aware, however, that the Commission on Accreditation of Allied Health Education Programs (CAAHEP) accredits very few ultrasound tech schools at the master’s degree level. All ultrasound technician schools will insist that you undertake 1 or more clinical rotations during your course of study. You can gain further experience through an extra internship if you want an additional ultrasound technician certification on hand when you leave school. You can start an internship even before you enter your program, and it can be a great way to secure a job once you are certified. Finally, it can be helpful to join a professional organization, such as the Society of Diagnostic Medical Sonography. In addition to being able to access more job boards and make contacts, it demonstrates your professionalism and commitment to the field. While ultrasound technician license requirements will vary by state, there are very few places that will not expect you to have proper certification in order to work as an ultrasound technician. When you finish your training, you are required to take an exam given by the American Registry for Diagnostic Medical Sonography in order to receive certification. Once you begin practicing, you will still be expected to renew your certifications regularly as well as partake in continuing education to gain new certifications. Very few states require that you be licensed, although, since New Mexico became the first in 2009, ultrasound technician license requirements are changing and expected to eventually cover all 50 states. The Society of Diagnostic Medical Sonography is at the forefront of efforts to establish consistency among state licensing laws to ensure that credentials and certifications are recognized nationally and that sonographers are not overly burdened. Laws regarding ultrasound technician certification requirements are more standard, and employers will expect you to either already have certification or to receive it within 1 year. To earn this ultrasound technician training, you will take at least 2 exams, each of which carries a $200 fee. Physics is a required certification field, in addition to whatever your specialty is, such as abdominal, OB/GYN, vascular, etc. You apply to the ARDMS to take each ultrasound technician certification exam. You may have to wait several months before exams are scheduled. If you can get more than one ultrasound tech certification when you are just starting out, it will make you a much better job candidate. The best training programs will require you to do a number of clinical rotations, with the expectation that you will perform around 950 hours of training, depending on the program. If you vary your work to enable you to surpass the basic ultrasound technician certification requirements, you will find it much easier to get a top job quickly. Once you begin work as a professional sonographer, you will be expected to gain more certifications in different specialties as you progress through your career. The ARDMS will require you to repeat your ultrasound technology certification exam every 5 years to remain certified, and you will also be expected to undergo continuing education in order to keep up with developments and innovations in the field. Ultrasound technology courses are offered on a variety of specialized subjects for professionals who are looking to maintain their certification or gain additional knowledge and skills. While the ultrasound tech license requirements are still in flux, there are some small private medical offices that may hire you without certification. This may seem desirable if you do not have the money to take the boards and so are not able to wait for certification to begin employment, but you should be aware that these offices may not have proper credentials themselves. So while you will not necessarily earn more money with a credential, you will earn more credibility. Furthermore, if you intend on advancing through the field, you must be ARDMS-certified. Whether you are just beginning your ultrasound technician career or are looking to advance, 1 of the best ways to get ahead is by word of mouth. Your good reputation will precede you, and excellent networking will open doors. It is up to you to remain positive, take initiative, work hard and pursue the ultrasound technician employment opportunities that speak to you. People love to be asked for advice, so never be afraid to ask, so long as you remember to take the advice. As you gain ultrasound technician experience during your clinical training, you will quickly find that some areas of the field appeal to you more than others. Make a special effort to connect with your teachers, the staff in the department and other professional ultrasound technicians. Let them know that you hope to pursue your ultrasound technician program or career in a particular area. They may even want to hire you themselves, and many grads have jobs lined up before they finish school. But if they cannot take you on, many professional are willing to help a talented sonographer connect with the right department. However, just because some graduates snap up full-time jobs easily does not mean it will happen for you, even if you graduate at the top of your class. Ultrasound technician employment opportunities are mostly excellent, but it can be difficult to land that first full-time, permanent job. Your job then becomes 1 of staying positive and continuing to work toward your goal. 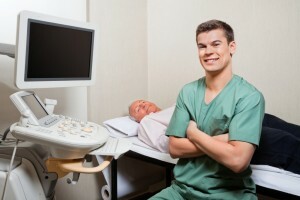 There are a number of things you can do to land ultrasound tech jobs when none seem available. You might volunteer at your school and offer tutoring to new students. This will show your dedication to the field and can open up other possibilities. Volunteer experience will always help you stand out in an interview, and practice with teaching might prompt you to pursue a higher degree, which will then allow you to go on and teach new students, while commanding a high salary. Remember that the biggest mistake you can make when you go into an interview is to be overconfident. You may have graduated with top marks and commendations, but you are still just a student and have a long way to go before you can prove you deserve the excellent ultrasound technician salary of a top job. Remember too that you are always learning, even after 10 years on the job. Ultrasound technology jobs have changed with medical innovations and will continue to do so. When you start out, take notes on all the procedures, even if you think you already know them. You need to get to know what individual doctors want and the protocols of a given department. The more adaptable you are, the more challenges you will be offered. You will have to earn further certifications and retake exams every 5 years, but if you realize from the outset that every day is about learning, you will advance much more quickly. Never be afraid to ask questions and ask for advice. Everyone can help you, and they all have something to offer. Asking and taking advice can be 1 of the best things you can do to help yourself when you are the new ultrasound technician. While the demand for top sonographers is growing, you may have a hard time landing your first full-time, permanent job. Stay positive, work hard and explore different opportunities. You will get there, and it will all be worthwhile. Ultrasound scans were introduced in the late 1950′s and are used for diagnosing in obstetrics and examining body organs such as the heart, liver and kidneys. Ultrasound scans are images of the internal organs made from sound waves. The information gathered from the reflections are brought back into a picture on the monitor. Movements are detected and measurements can be made from the images on the screen. Gestational age, fetal heart beat, and growth size can all be determined from an ultrasound scan. Pregnancy Ultrasound – Overview – Facts about pregnancy ultrasound scans. Ultrasound– An overview of what an ultrasound show during different stages of pregnancy. Diagnostic Ultrasound – The condition and stages ultrasound scans are used for. Ultrasound – Learn what an ultrasound scan is and the different ways of testing with it. Ultrasonography – Information on ultrasounds and how they are performed. Ultrasound FAQs– A list of facts about ultrasounds, including how they are performed and risks. Radiology Tests Used For Kidney Stones: XRay, Ultrasound, CT Scan, IVP and CT Urography– The different ways to check for a kidney stone. Fetal Ultrasounds – Information and images on the history of ultrasounds and why they are used. Frequently asked Questions About Ultrasounds– FAQ’s about kinds of ultrasounds. Why and when is Ultrasound used in A Pregnancy? An ultrasound is used to diagnose an early pregnancy. A gestational sac can be seen as early as four and a half weeks of gestation and the yolk sac can be seen around five weeks. Around five and a half weeks, measurements can be taken of the embryo. If vaginal bleeding is present in an early pregnancy, an ultrasound can be used to detect a fetal heart beat around 6 weeks. A blighted ovum can also be detected by an ultrasound, which is an empty sac with no fetal pole or heart. Ultrasounds can determine fetal age, especially early in a pregnancy. Ultrasounds help predict the gestational age of the fetus for women who are unsure of when their last menstrual cycle was. An ultrasound locates where the placenta is in the womb. This is important because there are many abnormalities that can occur with the placenta. For example, placenta previa and intrauterine growth retardation. An ultrasound can detect the amount of amniotic fluid inside the uterus. Excessive or decreased amounts of fluid can both cause a problem to the pregnancy. High Risk Pregnancy – A comprehensive guide on how ultrasound scans are used for high risk pregnancies. Post-term Pregnancy – An outline of what an ultrasound scan looks for in post-term pregnancy. First Trimester Screening – An informative guide on how ultrasound scans are important in the first trimester of pregnancy. Ultrasound in Pregnancy– Learn what an ultrasound looks for in different stages of pregnancy. High-Risk Pregnancy Ultrasounds– Understand the risk and benefits of an ultrasound. Fetal Echocardiography– A fetal echocardiogram is an ultrasound of the heart inside the womb. Ectopic Pregnancy– An ultrasound can detect if a pregnancy is ectopic. Doppler Ultrasound in High Risk Pregnancies -Information on how an ultrasound is useful for high risk pregnancies. Amniotic Fluid Problems / Hydramnios /Oligohydramnios– Information on low and excessive amniotic fluid and how an ultrasound diagnoses the condition. What are 3-D and 4-D Ultrasounds? A 3-D ultrasound gives 3 dimensional images of what is being scanned. Images are taken and sliced, then the computer interprets the images given as 3 dimensional. With computer controls, the operator can obtain views that might not be as clear as a 2-D ultrasound scan. Measurements are more correct and there is more of a psychological bond formed with the parents and baby. 3-D ultrasounds have been used to detect cleft lips, fetal cardiac problems, and chromosomal abnormalities. Recently, 4-D scanners have become the new attraction in the market. It can capture the facial movement of a baby. Experts agree that 3-D and 4-D ultrasounds are not necessary and that a 2-D scan is still suitable for diagnosing. 3D/4D Ultrasound Imaging– A review of the technology behind 3-D and 4-D ultrasounds. What is a Prenatal Ultrasound?– Information on how to prepare for a 3-D ultrasound. Obstetric Ultrasound – The official statement of the American Institute of Ultrasound in medicine about 3-D and 4-D ultrasound protocols. Different from x-rays, ultrasounds do not give off any ionizing irradiation or embryo toxic effects. High intensity ultrasounds coincide with the effects of cavitation and heating. Studies done in a laboratory setting show no abnormalities in embryos from the use of diagnostic ultrasounds. Smaller studies in Europe have shown some ill-effects such as speech and hearing problems as well as low birth weight. Information on Radiological Imaging: Ultrasound – An explanation of what an ultrasound is and its safety. Prenatal Testing: Ultrasound Safety and Accuracy– Information on the safety of pregnancy ultrasounds. Keepsake Ultrasound Pictures – An article about the safety of commercial sonograms from the American Pregnancy Association. Ultrasound During Pregnancy – Information on ultrasounds, including how they are done, information they can detect, and the safety of the procedure. Are Ultrasound “Snapshots” of Your Baby a Good Idea?– Basic information about ultrasound technology and safety. Ultrasound in Pregnancy – Detailed information about ultrasound procedures including safety. Diagnostic sonography, also called ultrasonography or ultrasound, is an imaging technique used for visualizing internal body structures. Images obtained during sonography examinations assist clinicians to arrive at a medical diagnosis. The medical personnel conducting diagnostic sonography examinations are referred to as medical sonographers, sonographers, ultrasound technicians, and sonography technologists or technicians. Sonographers are allied health professionals who, through formal education and clinical experience, have the knowledge and practical skills necessary to obtain quality images with ultrasound and sonography equipment. Ultrasound imaging examinations are highly operator-dependent, and require that sonography technologists possess extensive knowledge about normal anatomy and physiology so that abnormal conditions can be easily recognized. For example, if the technologist fails to correctly perform examinations, this may put patients at risk of having further unnecessary tests and may even lead to an inaccurate diagnosis. Due to the highly technical and complex nature of acquiring sonography images, those who operate the equipment must have adequate classroom education and clinical “hands-on” training. Sonography programs are available in hospitals, community colleges, universities, career vocational-technical schools, and the Armed Forces. Colleges and universities offer both 2-year and 4-year programs, leading to either an associate or a bachelor’s degree. The most widely available education is a 2-year associate’s degree program. For those who have previous education in another allied health field and are seeking to gain marketable skills in sonography scanning, 1-year sonography programs are available and provide a vocational certificate. The 1-year program provides practical sonography scanning skills for other allied health professionals such as nurses, medical technologists, radiologic technologists, and emergency medical technicians. Sonography training can be expensive and factors such as cost of program tuition, books, supplies, uniforms and certification examinations should be considered for each type of training program. 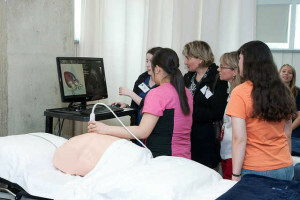 Online sonography-training programs provide an alternative for those who cannot attend traditional classroom programs. Online learning requires self-discipline and motivation to complete the assignments within the course timeline. Anyone considering online sonography education will need to have moderate to advanced computer skills and a dependable technology connection to access classes and return homework assignments on time. Before enrolling in an online sonography program, find out if it is accredited by an agency recognized by the American Registry of Radiologic Technologists (ARRT), and if the program arranges for hands-on clinical internship. High school students preparing for a sonography program should take courses in biological and physical sciences, algebra and computer literacy. The most difficult part of getting into a sonography program is getting accepted. Admission to a school or college is the first step, and after certain basic requirements have been met, application can be made for admission into the sonography program. Getting accepted is a competitive process, because each sonography program has an admission quota based on the number of clinical internship affiliation sites such as hospitals and medical clinics. Depending on whether the program is associate’s or bachelor’s degree, sonography students will take algebra, physics, medical terminology, anatomy and physiology, ethics of medicine, first aid and cardiopulmonary resuscitation (CPR), and public speaking. Because most sonography imaging equipment is digitally programmed and uses computer functions and software, computer proficiency is a very important skill that should be acquired prior to admission to a sonography program. Sonography education prepares students to perform 21 types of examinations. These include the specific body areas such as the abdomen, pelvis, superficial structures, gynecologic structures, and obstetrics. Sonography education also provides basic training in interventional procedures, special scanning techniques, and patient care skills. Students may choose 5 additional skills from a list of 10 elective procedures, which are considered specialty competencies. The 10 elective competencies include the gastrointestinal tract, adrenals, prostate, abdominal wall, breasts, superficial masses, musculoskeletal, fetal biophysical profile, amniocentesis, and pediatric or neonatal studies. After attaining general sonography skills, qualified sonographers may decide to acquire additional specialized training at a later time. Specialized training may focus on breast sonography, abdominal sonography, obstetric and gynecology sonography, neurosonography, and cardiac or vascular sonography. Upon completion of specialized training, the sonographer may be qualified to take additional certification examinations in the specialty area. Sonography education consists of both didactic (book learning) and clinical knowledge, and covers three major domains: cognitive, psychomotor and affective. The cognitive domain includes behaviors requiring various levels of thought: knowledge, understanding, reason and judgment. The psychomotor domain includes behaviors involving physical actions, neuromuscular manipulations and coordination. The affective domain includes behaviors guided by feelings and emotions that are influenced by an individual’s interest, attitudes, values, and beliefs. Curriculum for sonography programs is based on essential knowledge and hands-on skills required for entering the career field. Theory or knowledge classes may be delivered by “live” instructor lecture, taped instructor presentation, and online self-paced instruction. Laboratory classes also provide students with opportunities to participate in simulated patient care situations and various scanning examinations. While in the clinical internship environment, students are observed and mentored by a qualified diagnostic sonography supervisor. An accredited sonography program bears the responsibility for providing all of the required essential education and clinical internship experiences. Reliable information about accredited sonography programs is easy to obtain. There are several resources including accreditation agencies, the American Registry of Radiologic Technologists (ARRT), American Registry of Diagnostic Medical Sonographers (ARDMS), American Institute of Ultrasound in Medicine (AIUM), and the Cardiovascular Credentialing International (CCI). The U.S. military also offers accredited medical sonographer training programs. Professional sonography organizations and societies can provide helpful information about colleges and schools that offer specialized training in cardiovascular sonography, breast sonography, and advanced specialized scanning techniques. Professional organizations represent the interests of various groups to the public and to governmental bodies. The American Healthcare Radiology Administrators (AHRA) is the professional organization that promotes management practice in the administration of imaging services. The organization (www.ahraonline.org) is concerned about labor shortages in radiology and is a source of information about the availability of jobs in the U.S. The American Society of Radiologic Technologists (ASRT) is the professional organization representing x-ray technologists. The ASRT (www.asrt.org) produces educational curricular guides and other materials that promote the profession. The Association of Educators in Imaging and Radiologic Sciences (AEIRS) publishes educational information and provides data about the profession (www.aeirs.org). The American Registry of Diagnostic Medical Sonographers (ARDMS), American Institute of Ultrasound in Medicine (AIUM), and the Cardiovascular Credentialing International (CCI) are the premier professional organizations concerned with songraphy training and career opportunities. These societies are concerned about recruitment for the sonography technology and make special efforts to serve students and provide scholarships and mentorships to individuals interested in entering the career. The U.S. military also offers accredited programs diagnostic sonography training. Students, who successfully complete an accredited sonography program, are eligible to take a national examination in sonography offered by three organizations; the American Registry of Radiologic Technologists (ARRT), the American Registry of Diagnostic Medical Sonography (ARDMS) and the Cardiovascular Credentialing International (CCI). When most people hear the word ultrasound, they immediately think of pictures taken of unborn babies still in their mother’s womb. While this is a very popular and extremely valuable use of ultrasound, it is hardly the only use. Ultrasound technology is utilized in a wide variety of medical purposes. Ultrasound used for monitoring the brain, called a cranial ultrasound, is a great tool for assisting doctors with the diagnosis of a variety or brain related issues in babies. Cranial ultrasound is not effective once the skull bones have fused, so its primary purpose is in working with babies. However, during neurosurgery, when the skull has already been opened, cranial ultrasounds can be performed on adults, providing valuable assistance to surgeons looking for a brain mass. Ultrasound can be a very handy tool for doctors and ophthalmologists in taking an in-depth look at the structure of the eye. An ultrasound on the eye is performed by first numbing the eye, usually with anesthetic drops, then placing the ultrasound wand against the front surface of the eye. The sound waves of the ultrasound create a perfect picture of the full structure of the eye. This test can show a variety of issues and complications, such as vitreous hemorrhage (bleeding into the eyeball between the retina and the lens), the presence of cancer cells in the retina, separation of the retina from the back of the eye and swelling and the presence of foreign bodies that would otherwise be undetectable. Abdominal ultrasounds are useful in detecting a variety of issues in the organs of the abdominal region. These types of ultrasounds are used for diagnosing abnormalities in organs such as the kidneys, pancreas, gallbladder, liver, spleen and the abdominal aorta and various blood vessels of the abdomen. Abdominal ultrasounds give doctors a detailed look at the condition of organs that would otherwise be unattainable without actually cutting into a patient. One of the few limitations of abdominal ultrasounds is their ineffectiveness in giving a clear picture of the bowels or organs obscured by the bowels. Ultrasound images are negatively affected by gases or air, so getting a clear picture of the bowels is unlikely. Ultrasounds performed on the vascular system provide doctors with a good look at the effectiveness of the blood flow through areas of the body. Restricted flow of blood to organs of the body can result in a number of serious issues. Using vascular ultrasound, doctors can often pinpoint areas that are being supplied with a limited amount of blood flow. Detecting clots and blockages in the bloodstream is only one of the advantages of vascular ultrasound. The process can be utilized to determine a patient’s candidacy for certain procedures, such as angioplasty. Vascular ultrasound is also useful in detecting the presence and severity of varicose veins. In short, vascular ultrasounds are a great tool in locating issues of the blood stream that may otherwise go undetected and lead to serious complications. Ultrasounds of the prostate is called a transrectal ultrasound, is a process used to locate potential issues or disorders within the prostate. A transrectal ultrasound can determine whether a patient’s prostate is enlarged, which then allows for the proper steps to be taken to deal with the issue. Transrectal ultrasound also will detect any abnormal growths within the prostate. Many times, this test is run as a result of a nodule felt by a doctor during a normal prostate screening. Transrectal ultrasounds are also valuable in helping to determine possible causes of infertility in men. Invest 2min. for your future, it's fast & free - get your Information NOW (fill above) & have a fantastic day! !